Everybody know that, the quality of the coated aluminum sheet in stock is directly related with the processing technology. Nowadays, on the market, the roll coating and powder coating are the common seen process method of the color coated aluminium. Between them, the roll coating method can ensure high quality of the final product. Roll-coated aluminum sheet have topcoats, primers and backcoats. The backcoats are primarily resistant to oxidation and provide longer life. After roll coating, the process is semi-finished products – machine – forming – inspection – packaging into the warehouse. The surface of the roll-coated aluminium sheet is uniform, smooth, no leakage coating, shrinkage, scratching, peeling and other obvious defects. The color of the coated aluminium sheet mainly has white, black, red, blue, gold, green and wood pattern, or producing according to the colour card as customers requirement. Fluorocarbon roll coating is also a kind of roll coating, which is to add fluorocarbon to the paint, which makes the color adhesion stronger, the service life is longer, acid and alkali corrosion resistance, and it is often used for exterior decoration of buildings against sunlight and rain, the price of PVDF coated aluminium sheet is high, is the most high-grade one of the roller coated aluminium. 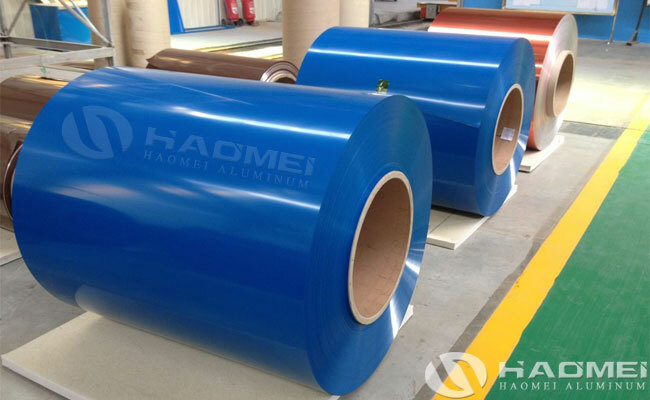 No matter PVDF coated aluminum sheet or PE coated aluminium sheet in stock, Haomei ensure the high quality with reasonable price.